We recently published an infographic that illustrated the importance of choosing healthy treats for your dog, and describes what exactly makes a good treat. 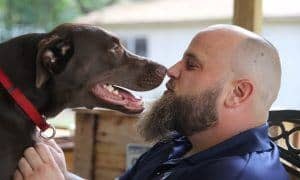 From meaty jerky-style snacks, to cookies, to biscuits, and even dental chews, choosing a SAFE and healthy treat is as important to your dog’s wellbeing as choosing a safe and healthy food. Merrick Dental Chews are available in five varieties. You’re sure to find one that’s perfect for your pup! Flossies for dogs 15+ lbs., Texas Toothpicks for dogs 15+ lbs., Mini Brush Bones for dogs 5 to 15 lbs., L’il Brush Bones for dogs 15 to 25 lbs., and Big Brush Bones for dogs 25+ lbs. Bags retail for $16.99. Look for them online, nationwide at Petco stores or at your independent pet specialty stores. 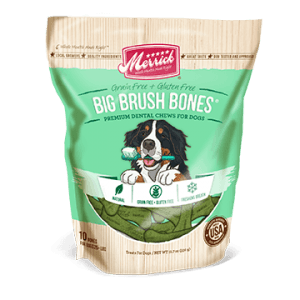 Merrick Pet Care and Dogington Post are giving away 25 bags of Merrick Dental Chews to 25 Lucky Readers! Enter Below! Winners will be announced on October 24th. BONUS! Our resident canine cookie tester, Kalba, will randomly choose 5 of the winners to also get a bag of her absolute most favorite treats – Merrick’s grain free, made in the USA Jerky Chip Treats! Enter below and you’re automatically entered to win them, too! 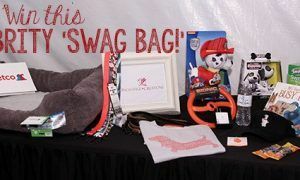 GIVEAWAY: Win a Celebrity ‘Swag Bag’ from FOX’s Cause for Paws Thanksgiving Special! 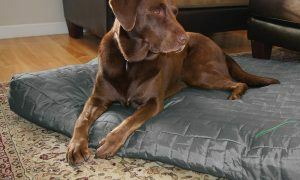 Review & Giveaway: Kurgo Dog Essentials for Home or Away! Hi Jennifer – we entered the giveaway for you. Good luck!